- Full Day Windsor, Oxford and Stonehenge Tour: Windsor, awash with natural beauty, discover the 17th century historical monuments which line its cobbled streets. Fans of the Royal family will be in their element! Steeped in history, you will have the option to visit the home of Queen Elizabeth II and enjoy a through keyhole experience of the world's largest and oldest castle. Enjoy a walking tour and free time. Then on to the mysterious Stonehenge, you will never forget the first glimpse of the spectacular Stonehenge, its monolithic rocks rising up against the skyline on Salisbury Hill. Theories abound about the mysterious rock formations. Was it intended as a religious temple? An astronomical clock? A Bronze Age burial ground? Make up your own mind as you explore the unique landmark that has the world stumped for 5000 years. structure?. Then follow in the footsteps of Oxford famous students, from C.S. Lewis to Bill Clinton, as you stroll the captivating college courtyards and cobbled lanes of this historic university town. Take in the famous 'city of dreaming spires' and see the Bodleian Library , one of the oldest libraries in Europe, on your visit. You'll be captivated by the unspoilt narrow alleys and ancient squares of this naturally beautiful town. *Conditions Apply: Prices are per person, capacity controlled and listed in Australian dollars twin share including port taxes. Prices may fluctuate if surcharges, fees, taxes or currency change, and may be withdrawn at any time. Prices shown here are not shown in real time. While we endeavour to keep our pricing as up-to-date as possible, the advertised prices shown here may differ from the live prices in our booking system. The prices shown are for a cash payment. Credit card fees of up to 2.5% will apply. Offer correct as at 07Mar19 and subject to live availability at time of booking. Prices are per person twin share based on best available cruise fare, inclusive of all discounts unless otherwise stated. All offers are capacity controlled and can be withdrawn or modified at any time without notice and subject to availability at time of booking. Outside and Balcony cabins may have obstructed views and Suite cabins comprises Junior Suites, Mini Suites and any other type of suite that represents the best value for each cruise. Unless otherwise stated, all packages containing airfare will require full airfare and taxes within 24 hours of reservation and cancellation/amendment conditions apply. Air taxes are included in package price and are subject to change depending on departure city. Unless otherwise stated, onboard gratuities are NOT included. ~Specialty restaurants may incur a surcharge. Cabins are based on guarantee and cabin number will not be assigned until documentation or embarkation. +Hotels in certain cities must charge local government tax directly to guests upon checkout which cannot be collected in advance by our agency. All passports, vaccinations and visas are the responsibility of the travelling guest to secure prior to departure from Australia. Some cruise lines reserve the right to impose a fuel levy if the NMEX price reaches a certain level - please check with your consultant at time of booking. Cruise deposit, amendment and cancellation conditions apply. Travel agent service fees not included. Special conditions apply - please ask for full details at time of enquiry. Offer ends 03May19 or until sold out/withdrawn from sale. Please note only residents with an Australian address are eligible to book Australian rates in Australian dollars. This cruise package is provided by Seven Oceans Cruising, please ask your travel agent to contact us for more information. 16 Night Cruise sailing from Dover roundtrip aboard Boudicca. Journey off the well-beaten tourist track to unearth the fascinating culture and inspirational scenery of Greenland’s most remote regions on this memorable cruise adventure. Astonishing waterways, remarkable natural wonders and enchanting settlements await amongst these isolated lands, and smaller-sized Boudicca is your guide to uncovering the very best of them. The four days of Greenlandic exploration featured on this incredible 16-night itinerary are packed with unforgettable experiences. After visiting Iceland for an overnight stay in Reykjavik, gateway to the wonders of the Golden Circle and the Blue Lagoon, scenic cruising of the immaculate Prins Christiansund and Torssukátak Fjord provides the perfect introduction to the scenic splendour of Greenland. Views of soaring mountains, glorious glaciers, imposing icebergs and cascading waterfalls will whet your appetite for what’s to come. Your first chance to step foot on Greenland’s shores comes in Qaqortoq, where you could visit the interesting museum and intriguing Stone & Man sculptures, or perhaps experience the Greenlandic tradition of Kaffe-Mik in the company of the town’s friendly locals. Qaqortoq is also ideally located for tours to the Great Lake, which boasts some of the country’s most breathtaking Arctic landscapes. Then there’s Narsarsuaq, starting point for boat tours to the awe-inspiring Qooroq Ice Fjord. Take the exhilarating ride into Qooroq and you’ll see beautiful blue icebergs, which break away from the magnificent Qooroq Glacier, up-close in all their frozen glory. Alternatively, you might choose to venture up Signal Hill in Narsarsuaq to marvel at the unspoilt scenery of Tunugdlliarfik Fjord, before embarking Boudicca once again to sail Tunugdlliarfik in the evening en route to Nanortalik. Your final call in Greenland offers a fascinating insight into life in region; the Open Air Museum showcases traditional clothing, kayaks and much more, while a live performance of song and dance from the locals is sure to delight. 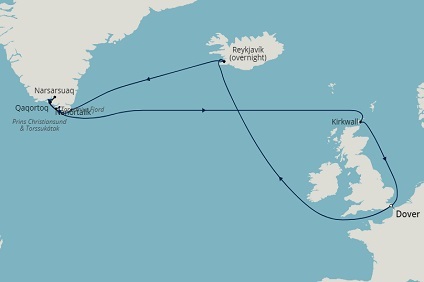 For one last memorable Greenlandic experience, you’ll also enjoy scenic cruising of the majestic Tasermuit Fjord before Boudicca heads back to Dover via Scotland’s rugged Orkney Islands. The cosmopolitan city with big heart is home to the Althing – the world’s oldest parliament, and the National and Saga Museums, which trace Iceland’s Viking history. The impressive Hallgrímskirkja Church bell tower and the rotating Perlan glass dome offer panoramic views off island. Reykjavik’s galleries and exhibitions, including the outstanding Reykjavík Art Museum and National Gallery, feature radical Icelandic design, and there are many public art installations. The capital has benefited from a recent surge in high-quality restaurant openings, offering a broad mix of creative cuisine. Daytime cafés switch to restaurants and bars at night – tapas, concept-dining and burger joints all sit comfortably together. And then there’s the wonderful nightlife. Frequently isolated by winter sea ice, the ‘White Palace’, Qaqortoq, is southern Greenland’s largest town. Founded by Norwegian traders in 1775, Qaqortoq still retains some beautiful colonial buildings from that time. The challenging landscape and harsh climate have ensured the preservation of Greenland’s traditional culture, and the many ancient Inuit skills of fishing, hunting and kayaking. Qaqortoq is very proud of its ancient fountain – for many years the only one in Greenland – which has carvings of whales spouting water out of their blowholes, and the names of all of the town burghers in brass letters around its base. The Stone and Man project is also fascinating, featuring natural rock that’s been carved by local artists into abstract shapes and figures. The charming Church of Our Saviour, dating from 1832, is found in the town centre, and the two local museums are also worth seeing. The ancient but well preserved Hvalsey Norse ruins are just outside the town. Hvalsey is mentioned in the Icelandic annals, the Flateyjarbók, and has extensive and substantial remains of dwellings dating back over a thousand years. Nanortalik – Greenland’s most southerly town – is unlike any other town in the country. Sat on a small island at the end of a wonderful fjord and surrounded by vast snow-topped mountains, the ‘Place of Polar Bears’ is truly unique. The small woodlands and prairies against a spectacular backdrop make this is a nature lover’s paradise. Polar bears live and hunt on the sea ice close to the town and are often seen from the shores of Nanortalik. Seals and whales can also be spotted in the surrounding waters. In the winter months, visitors are often lucky enough to capture the Aurora Borealis – Mother Nature’s own spectacular display, with curtains of white, yellow and green flashes lighting up the sky. The town has a well preserved historic quarter where there are cafés and an unusual wooden church. Brightly coloured houses line the streets, while the Nanortalik Museum has some fascinating exhibits including the oldest women’s boat ever found, which dates back to 1440 and was found by polar explorer and artist, Eigil Knuth.